I don’t write much about our life in a small town, but one effect of living here is an aversion to crowds. I don’t even drive to our dinky mall on weekends, lest I have to park more than three rows away from the entrance. So alarm and dread resulted from the realization that the “perfect storm” awaited us at the Smithsonian National Air and Space Museum. A free museum in our nation’s capital. An overcast weekend. The week of Spring Break. Perhaps I saw you there, too? 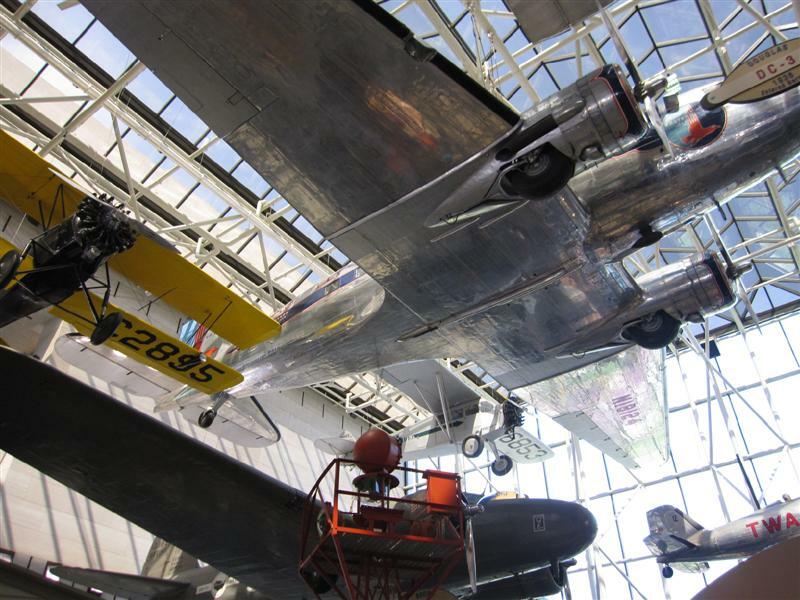 There are so many wonderful, kid-friendly museums in Washington, DC, but I knew the one which would most interest my kids would be the Air and Space museum, home the world’s largest collection of historical aeronautical artifacts. For The Boy, it meant geeky science stuff. The Girl, ever fearless, would get more ammunition for her dreams of space flight. Of course, it’s awesome, and truly amazing, that admission to this facility is free. There are additional experiences which cost extra, but these are still affordable, and totally worth it. As soon as we arrived, we bought our tickets for one of the three IMAX movies and one of the three planetarium shows which are shown on a frequent, rotating basis. We were glad later when we saw the long ticket line. Both the IMAX movie – To Fly! — and the planetarium show – Cosmic Collisions – kept both kids entertained, but more than that, it was SO nice to sit! I was correct in assuming that The Boy would want to try the virtual flight simulator. Matt went with him, and looked a little green upon exiting. “He’ll never be a pilot,” was all he was capable of uttering. Apparently, barrel rolls were part of the experience. You spend most of your time here looking up at the suspended airplanes and space craft. Which is a pleasant departure from seeing the top of people’s heads as they check their mobile devices! We were even more fascinated by the exhibits you can walk through for a better look at the interior compartments and control panels – like the 747 cockpit, the vintage DC-7 cabin, and the Skylab Oribtal Workshop. 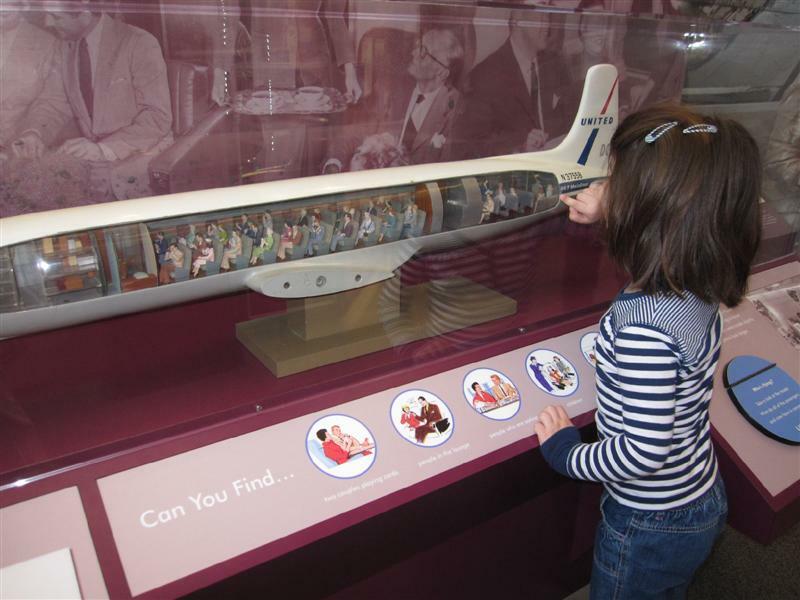 The DC-7 cabin was part of my favorite exhibit area, covering the glamorous days of air travel in the 1950’s and 60’s. 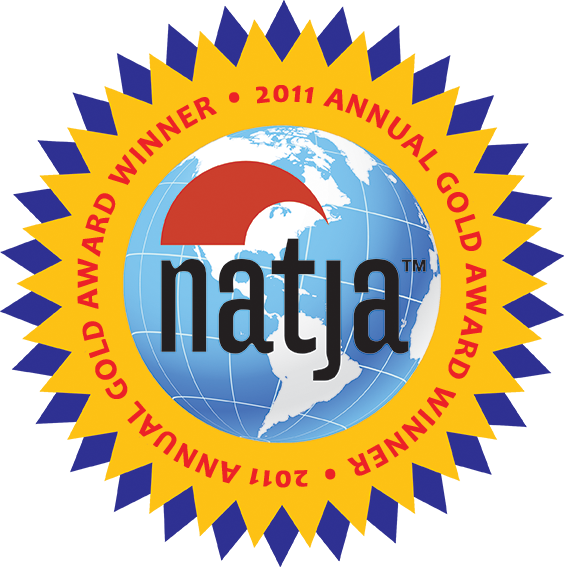 I was a sucker for Pan Am on ABC for the same reason. I wanted to be a stewardess when I was a kid, back when it was all about high heels and pearls. And less about taking down rowdy drunk passengers. I Spy a hot meal, cigarette smoke, and a non-deranged pilot. This was a model which travel agents would display in their offices. Now it’s an “I Spy” game which The Girl was all-too-excited to play. She spied at least three passengers smoking! The Boy was excited to join a paper airplane contest, because he considers himself something of an expert in stationery aeronautics. The guide used the competition to introduce the concept of stability, and taught them to fasten paper clips to the bottom center of the plane to make it fly straighter and farther. Then she made a quip about the paper being the only free souvenir we would get that day, and asked for us to return the “government-issued” paperclips! Both kids, The Girl especially, liked the “How Things Fly” exhibit, which was the only area specifically designed for kids. 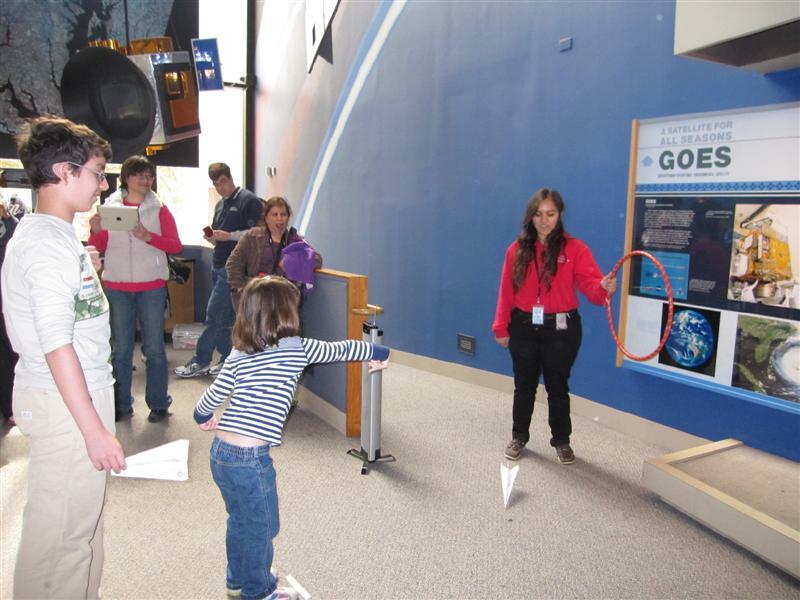 The hands-on exhibits here introduced concepts such as lift, thrust, drop, and air pressure. 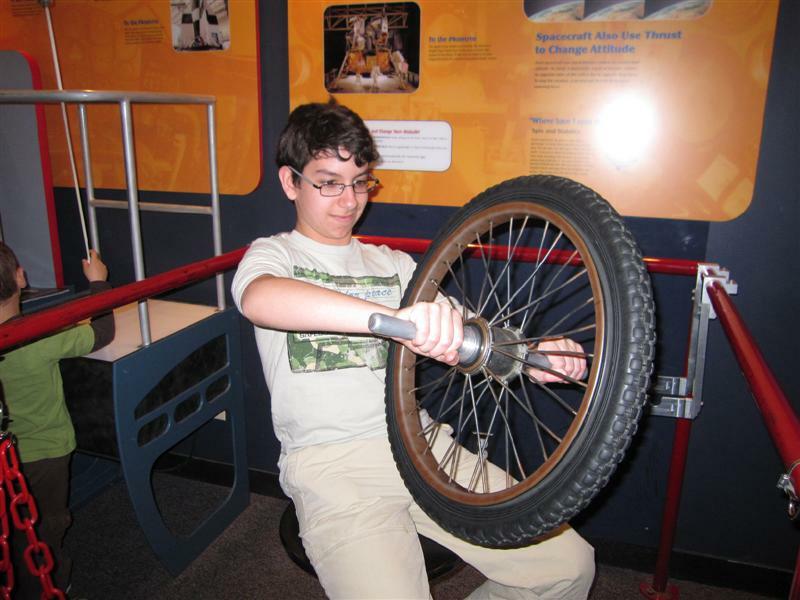 This wheel, spun by a docent standing next to The Boy, demonstrated the concept of attitude. When he turned the wheel, it created enough force to turn him in the swivel chair. 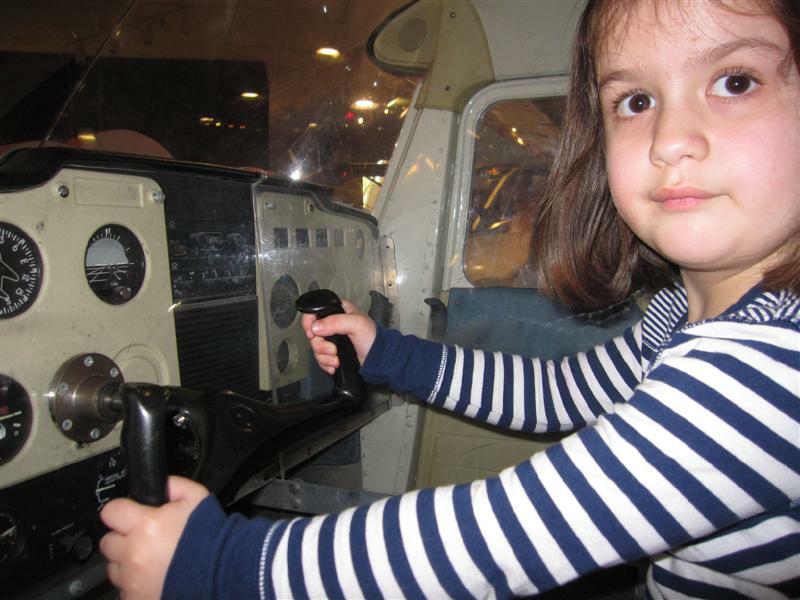 Aboard this Cessna 150, The Girl could control the rudder, ailerons, and elevator. “You mean I'm not really flying this plane? What's the point?" There are so much on display here; you could spend days! I would advise arriving when it opens at 10am, and checking a map to decide which exhibits you most want to see. Visit those first — before the rest of the world shows up. NOTE: There are two locations. We visited the National Mall building in downtown Washington, DC. 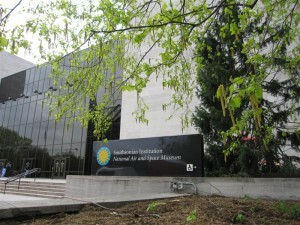 The other is the Steven F. Udvar-Hazy Center near Washington Dulles International Airport. Although I don’t share the same interest in aeronautics, it sounds like a great place. LOL at the simulator. We were going to try that then we watched it do a barrel roll and decided that it might not be our best plan. Your husband is brave! And I hear you about the best part being a place to sit down! For such a small city, I don’t think I’ve ever walked that much in my life.